Bindhumalini Narayanswamy is a singer and composer trained in Carnatic Music under eminent musicians Rama Ravi, Kiranavali, Mangalam Shankar and G.Madhavan. She studied Hindustani classical music under the Padma Bhushan awardee, the late Ustad Abdul Rashid Khan Saheb. Suno Bhai, a collection of Kabir songs, is her first album and was created in collaboration with Vedanth Bharadwaj. The pair has also composed music for the Tamil feature film Aruvi. The Kannada film Harikatha Prasanga marked her debut as a music director. She has also worked on various other short and documentary films. Vedanth Bharadwaj is a student of Indian classical music, currently under the tutelage of Ramamoorthy Rao. He is a singer, guitarist and composer and has his own studio. 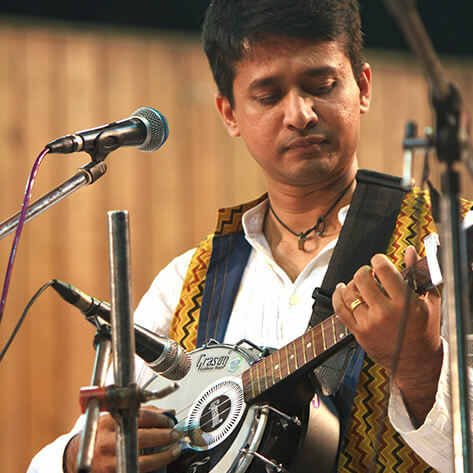 Having produced and released two albums, Mati Kahe and Suno Bhai (in collaboration with Bindhumalini), he also sings songs written by mystic Sufi and Bhakti saint poets. He has performed at several music festivals and venues in India and abroad, including The Playhouse Theatre Company in South Africa, the Mumbai Kabir Festival, The Repertwahr Festival and the Sacred Music Festival at Pondicherry. He is currently working on an album of abhangs with singer Shruthi Viswanath and composing music for a feature film called His Father’s Voice, both slated for release this year.